All goalkeepers have to be patient to win a place in the starting XI from time to time, but Craig McDowall has had to wait longer than most. 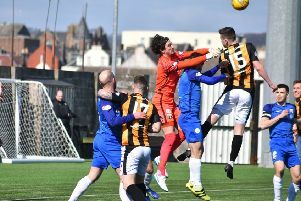 The ‘keeper had yet to make a competitive appearance for the Methil men, and looked unlikely to do so anytime soon, until Brett Long’s over-celebration against Raith Rovers saw him sent off and subsequently suspended. It handed McDowall the chance to come in against Airdrie seven days later, with manager Darren Young sticking by the goalie for the weekend’s 2-1 cup win at Berwick. McDowall admits it’s great to pull on the gloves again after a frustrating wait. He said: “We lost four goals against Airdrie so from a personal points of view I was disappointed. “But looking back over their goals, there was a deflection and a penalty. “I was delighted to get another chance because before last week I hadn’t played a competitive game in around 16 months. “Berwick was only my second game back so I’m still trying to find my feet a bit. McDowall is hoping to retain his place in the starting line-up this weekend when the side returns to league duty against Montrose. He added: “We had a great result against Raith a couple of weeks back before the disappointing result against Airdrie. “So it was good to get a wee break and go down to Berwick and get our name in the hat for the next round of the Scottish Cup.